Garden Whimsy or Garden Junk? 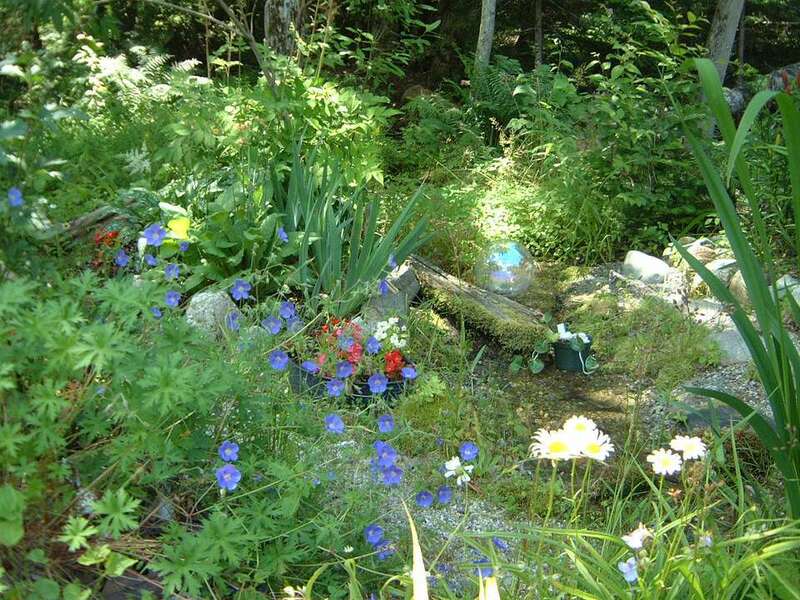 About Gardening Forum member, Magpie, threw down the gauntlet with these photos of what she called her 'Garden Junk'. She hoped other members would show their personal garden design style with photos of the decorations in their own gardens. Well, we're still waiting for someone to answer the challenge. Magpie's heading 'Garden Junk' doesn't begin to do service to her sense of humor and style. I'm sure she can't be alone out there in having fun using everyday items to add an element of surprise to her gardens. If so, I hope these photos inspire you to add some unexpected whimsy to your own gardens. If you do - or already have - send in your photos to share. We're all always looking for more ways to express ourselves in the garden. Whether you're a fan of gazing globes or not, you have to do a double take at this 'soap bubble'. "Every 'kitchen' garden needs soap bubbles. $35 gazing ball carefully placed in my little stream"
Continue to 2 of 6 below. I know most gardeners don't worry about housework during summer. Who can keep up with all the mud we track in anyway? So put your thoughts of laundry to better use. "A wash tub, Home Depot and just a few dollars, with a new from PA scrub board. Notice the soap bubble again!!!" Continue to 3 of 6 below. I think we have a theme here. I wonder what the experts would make of Magpie's fascination with moving the laundry room outside? "The wringer-washer, free, that dh said was NOT going in the garden. After some spray paint and careful placing, he didn't notice it for 3 days! the white petunias represent soap suds." Continue to 4 of 6 below. Very sly. At first glance I couldn't figure out what those round pieces were. "A muffin tin, 25 cents, upside down on the garden path." Just think of the odd bits that would become conversation pieces along pathways. Every garden should have a place for entertaining and this spot is almost too much of a tease. It's not break time just yet. "A children's tea set, $3, on a little stand, $1." Continue to 6 of 6 below. Never tell someone they've used everything but the kitchen sink. In my experience, they will find a way use it. "Dh said one day that I had everything but the kitchen sink, so I had to get one. $35, on an old aquarium stand, $3. Dh decided we needed a pump, $50, so the overflow from our well comes out through the pump, into the sink, and down the drain into the little stream." Sounds like Mr. Magpie has finally thrown down the towel and joined in the fun. What Are the Most Enjoyable, Fragrant Flowers to Plant in a Home Garden?